Hi! My name is Gina Harney, and I'm a group fitness instructor, personal trainer, certified Weight loss specialist, and the blogger behind The Fitnessista. I have two small daughters, and continued to work in the fitness industry during and after both pregnancies. After our first daughter was born, I was shocked by the lack of information available about returning to fitness safely after baby. The midwife simple said to "Do what I did before, and do what feels good." Good chat, nurse. The thing is, there are some exercises that can hinder your progress post-baby, and it's so important to progress in a safe manner. While you can feel great on the outside, there's a lot of critical internal healing that needs to transpire. In an effort to get my fitness back, I researched as much as possible to learn which exercises are safe, and took workshops and courses to expand my knowledge. I'm so excited to share everything I learned with all of you! When you have a baby, you have enough on your plate. It can be so hard to find motivation when you're juggling feedings, nap times, and covered in milk and/or spit-up. You want to get your fitness levels back, but want a fairy to appear who can tell you what's safe, how much to do, and propel you towards your goals without overtraining. I've got you. Those who are looking for their pre-baby body. It's gone! Your body did an amazing thing, and you can be stronger, more fit, leaner, and feel amazing post-baby. 12 weeks of detailed training plans in an easy-to-follow format. 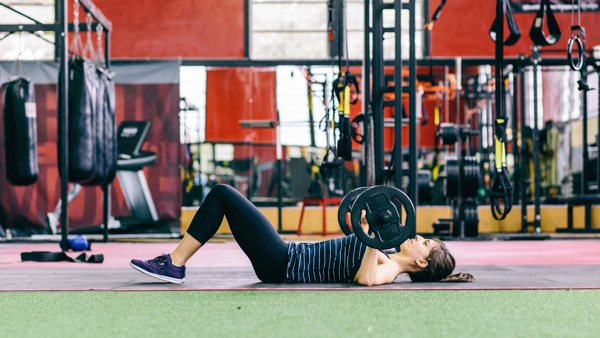 This plan takes all of the guesswork out of developing a fitness routine post-baby, and safely progresses from one 4-week module to the next. The first module focuses on establishing a fitness routine after medical clearance to resume exercise, and gradually builds up to high intensity interval circuits and dedicated core training. The exercise glossary breaks down each move so you know what to expect, and how to safely perform each exercise. Updates to the plan, plus advanced workouts and bonus recipe ideas from now on. This being my third baby, it was hard to find something that I could fit in with my busy schedule. PBB was great because in the first few weeks, I could go for a walk in the morning and then lift during naps. Since I was already taking the kids for walks, this worked out perfectly! 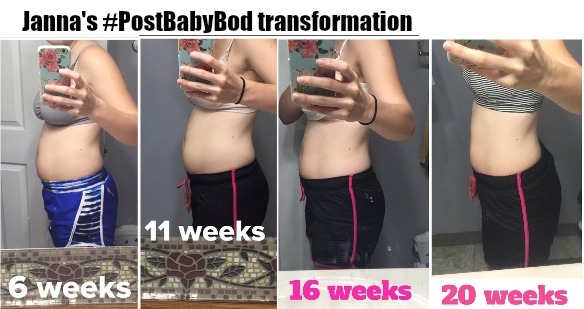 Combined with Gina’s meal plans, I was able to shed my baby pounds quickly and have happily returned to my pre-pregnancy weight with a stronger, leaner physique. Thanks Gina!!! The strength program was well designed. Gina clearly considered the need to ease into strength training after pregnancy and designed the workouts to be challenging and fun while also making sure we treated our healing bodies with respect. I noticed gains in my balance, upper body strength, and endurance. While pregnant, I lost a lot of muscle and I needed to have a program that responsibly reintroduced me to strength training. It would have been easy for me to walk out of my six week check up and jump right back into a HIIT workout, but set myself up for injury. Gina’s program laid a good foundation to build up to my prior level of fitness in an injury free manner. I was so happy to see your PBB plan and hear that it really focused on easing back into exercise in a healthy way. I just did the first workout of Week 5 this morning and have been following the plan almost exactly. I did start to add in some light jogging in the first 4 weeks in a way that felt good and not forced. I feel so much better mentally and physically this time around, and I am so grateful. Exercising isn't adding additional stress to my day; it's enhancing it and making me feel more energized and like a better version of myself. When I first got pregnant I was extremely scared about DR cause I had so many people tell me horror stories. I knew once I saw PBB that it was something that I wouldn't have to worry about. I extremely enjoyed that it was all laid out for me and I didn't have to think about it. It's nice when you're adjusting to a new schedule and caring for another human being not to have to think about your workout. I had to stop when going back to work but I'm picking up where I left off and I can't wait to see more changes. Thanks for sharing this-I loved the strength/cardio splits so I could split it between naps if needed. It was a great foundation. I lost 10 more of my baby pounds. As someone who tends to overdo it, I was really thankful to be able to test out Post Baby Bod and have some guidelines to help me ease back in. I felt like I was able to keep up my movement without overdoing it and jeopardizing my health as I recovered. Even though I exercised until the day I delivered, I know my energy, strength, etc. were not there right away at 6 weeks postpartum. Even knowing this, I would have tried to jump right back in where I left off exercise-wise. Not smart for my body or mind. I have really enjoyed the increasing difficulty with each week and seeing the strength gains I’ve been making since week 1. Thank you so much for this program! After baby number 2 I was excited to get back to my regular fitness routine, but I had unrealistic hopes of jumping in right where I left off just months before. 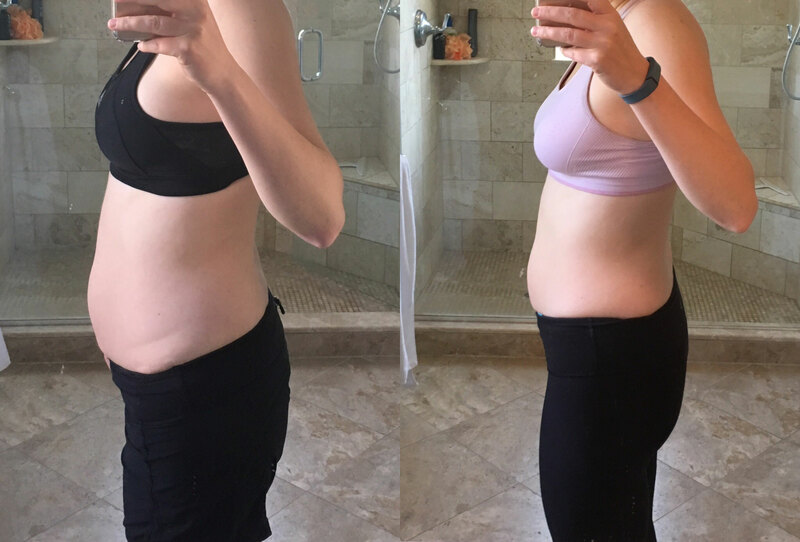 Post Baby Bod helped me set realistic goals and safely re-build the strength I lost. I loved including the stroller in many of the workouts, and being able to workout from home while my baby napped was priceless! This PBB plan was a life saver for me. When I got the go-ahead to resume exercise I had a plan ready to go- a NECESSITY with a newborn and 16 month old. I loved how it took the thinking out. The simple workouts at the beginning started getting my body and mind back into a groove. The workouts steadily became more challenging, and I was able to adapt them to meet my needs. I loved being able to include my babies in my workouts too! What a perfect example for me to start setting for them from the beginning. The weekly “goals” were also helpful as it sometimes seems we’re not going to accomplish anything (whats a shower, anyways?) those first weeks/months with babies. It really gave me ONE thing to focus on for myself, even if it was just to drink more water, or eat cleaner. I think its hard to feel like we can take a break and do something for ourselves. This was a good way for me to focus on being a healthy version of me, FOR MY KIDS! I have no regrets and only good things to say. I know that without this program I would have either jumped into intense workouts too soon, or been overwhelmed by thinking of my own workout and not working out at all. It was great to be responsibly led back into feeling fit. After 12 weeks, I feel stronger and comfortable running. I loved the PBB Plan! I was so ready to start working out again and It was helpful to have a plan to keep me from overdoing it! I was back to my baseline fitness level by the end and had lost 10 lbs! Thanks Gina!